WASHINGTON (Sputnik) - A meeting planned between US Secretary of State Michael Pompeo and North Korean officials in New York later in the week has been postponed, State Department spokesperson Heather Nauert said in a press release. "Pompeo’s meeting with officials from the Democratic People’s Republic of Korea, scheduled for this week in New York, will now take place at a later date," Nauert said. "We will reconvene when our respective schedules permit. Ongoing conversations continue to take place." Earlier in October, during the meeting in Pyongyang, the US state secretary and North Korean leader agreed to create a joint working group to discuss in the near future the denuclearization of the Korean peninsula and another possible North Korean-US summit. Over the last few months, the situation on the Korean Peninsula has significantly improved with the North Korean leader pledging to give up his nuclear aspirations after several rounds of talks with his South Korean counterpart Moon Jae-in and a historic summit with Trump this summer. The first summit between the US and North Korean leaders took place in Singapore in June. 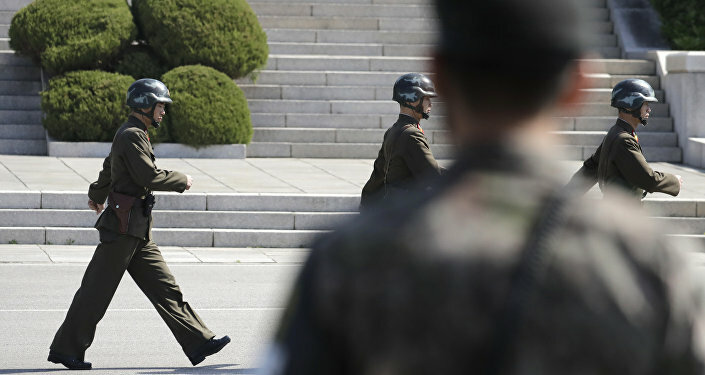 During the meeting, the two sides reached an agreement stipulating that Pyongyang would make efforts toward the promotion of complete denuclearization of the Korean peninsula in exchange for security guarantees for North Korea.